I had seen the movie before jumping in to this book, and I was aware that the book was different. My youngest son has read the book a couple of times already and so I thought I should at least check this out. Zombies, in our pop culture, have been on the rise for some time now – thanks in part to television shows such as The Walking Dead (based on a graphic novel series) and books such as this. The basic premise in most of these scenarios is that a catastrophic event has taken place so that humans are invaded or converted so that the human part of them has died and the new, now-in-control-of their-bodies part of them has one goal – food. And that food is usually human brains. 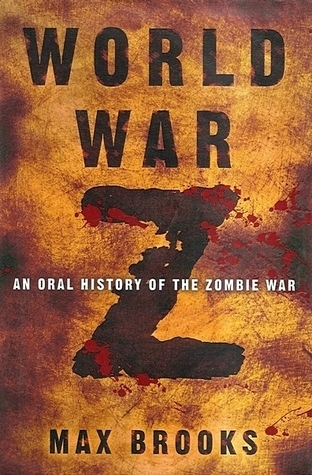 Max Brooks’s book is subtitled “An Oral History of the Zombie War” which, aside from being ironic since this is obviously written word, gives the reader a pretty good clue as to how this book will be presented. Brooks takes on the role of reporter, documenting and reporting on the rise of the zombies and how different armies and factions managed to ward them off and survive. This allows for a plethora of ‘first hand accounts’ and lots of raw emotion from the interviewed individuals. Though you can put the pieces together and get a story, this book doesn’t really provide much of a narrative. It’s a moderately clever technique, but we don’t spend enough time to connect to the people … the survivors. instead we rely on the quick, episodic, shock and awe aspect. This works for a time, but because of this I would often put the book down for weeks at a time, knowing that it didn’t matter what I might have forgotten because it wasn’t vital to whatever would happen next. I am glad that I read this, but it’s not high on my books to recommend. Looking for a good book? You might want to read this out of curiosity, but there is definitely some better zombie fiction out there.